For college football fans in the state of Nebraska, there hasn’t been a more exciting individual to dawn the Cornhuskers uniform than Johnny ‘The Jet’ Rodgers. His explosive speed and quick acceleration led him to become one of the most beloved football players for the University of Nebraska and one of, if not the best, punt returners in the history of American College Football. In his three seasons with the Cornhuskers Rodgers broke virtually every offensive team record, was named to the College Football All-American Team twice, and was honoured with both the Walter Camp Award and the Heisman Trophy in 1972 as the league’s most outstanding player. 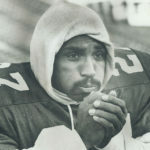 He has won the CFL Grey Cup, was the 1973 CFL Most Outstanding Rookie, and was a four-time CFL All- Star. Today, ‘The Jet’ is still a household name in the state of Nebraska for his excellence on the field, but he is also an important figure for reasons far more important than football. Although Nebraska is a striving state with many wealthy companies and individuals, it also has one of the highest poverty ratings in the United States amongst African American families; a stat that Rodgers is working to decrease by not only caring for today’s poor youth, but the families and history in which they come from. “I started the Johnny Rodgers Youth Foundation because I come from a very needy community. I come from a place where we have more millionaires per capita than any other place in the United States. Based on our population it’s quite significant because it’s a very small population, we also have more poor black people than any other place in the country. In Nebraska the adults are rated number 3 in poverty across America and the children are rated number 1 in the country, and that’s including LA and New York,” Rodgers explained. “We have some significant problems as far as education is concerned. We may graduate 1 out of every 10 students and it’s actually getting worse because of the poverty level we have here. Over the last three generations, we have gone down considerably in Omaha, Nebraska but you wouldn’t know it because we’re a thriving community. They post our numbers for unemployment around 5% which is probably true for the people who are on the employment or tax records, but most of the black people aren’t on the tax records and there’s just no way for them to get out,” he said. Unlike many other youth foundations or groups who assist troubled or poverty stricken teens, the Johnny Rodgers Youth Foundation digs deeper into the problem and looks to assist not only the child, but the family in which they come from. “You have so many different mentoring programs where you’re helping the youth, but it’s very difficult to help the youth when you encourage them to do something and then they have to go back home and back into that environment and then the peer pressure for them even doing well doesn’t sit well with the people around them because they’re not getting help at home,” elucidated Rodgers. “We go in and try to do an evaluation or assessment of the whole family structure and find out what is wrong within that family and try to help direct maybe the mom to different recourses to strengthen the whole unit instead of just that one kid,” he added. What is most striking about the families being assisted by the Foundation, is the severity of poverty in which most of these families are living in. Many students in the winter months head to school because it is warmer than most of their homes and 90% of the African American students in Omaha, Nebraska, are on the free or reduced lunch programs because they are unable to afford $1.10 worth of food a day. On April 12, 2012, the inaugural Johnny “The Jet” Rodgers National College Football Return Specialist Award was handed to Arkansas senior Joe Adams in honour of his 2011 campaign. The award is the first and only return specialist award in college football and the event raised money for the Johnny Rodgers Youth Foundation and some of the other 25 charities ‘The Jet’ supports. The success and accomplishments Rodgers reached throughout his career were obtained through his hard work and commitment. Like all things in life you have to have the want and desire, alongside the passion and work ethic to achieve any form of personal success; a thought process that is followed by Rodgers and his Foundation in order to sustain long term success and stability within the poor or broken families. “We don’t give away money as much as we direct them to the different recourses that can help them get money or education. You have to be trying to get there, not just sit around collect a check and get free food. As along as you do that you’re not helping anyone else which is happening right now with the kids coming up behind these families and it has gone on for over 30 years now,” he stated, “We need to teach them to become self sufficient while ensuring stability”. Johnny Rodgers keeps active within 25 charities across the state of Nebraska and works hard to provide the youth and their families with assistance through providing a sense of direction and understanding. He encourages young students to complete their education with a full understanding of their self worth and personal limitations while exploiting their strengths within society.